All tankers know that this year Wargaming celebrated his birthday. I say this so confidently because miss this was simply impossible. Indeed WG graced us with many surprises and prizes. 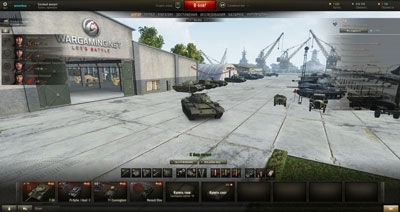 One of them was the hangar to birthday WG from WOT 0.9.17.1 If you liked this hangar, you can install it yourself. Fact it came out pretty nice and comfortable. Our tanks will leave the street, at the airport is already familiar with the port away. The hangar was added to riding machines that carry ammunition, as well as aircraft, which calls in the hangar.